Join us for an interactive cross-cultural communication workshop to increase your effectiveness in a multicultural environment. Sarah F. Aptilon, Senior Consultant at Global Intercultural Consulting, will share her insights on strategies for building trusting relationships and achieving clear communication with colleagues, employees, business partners and clients from other cultures. 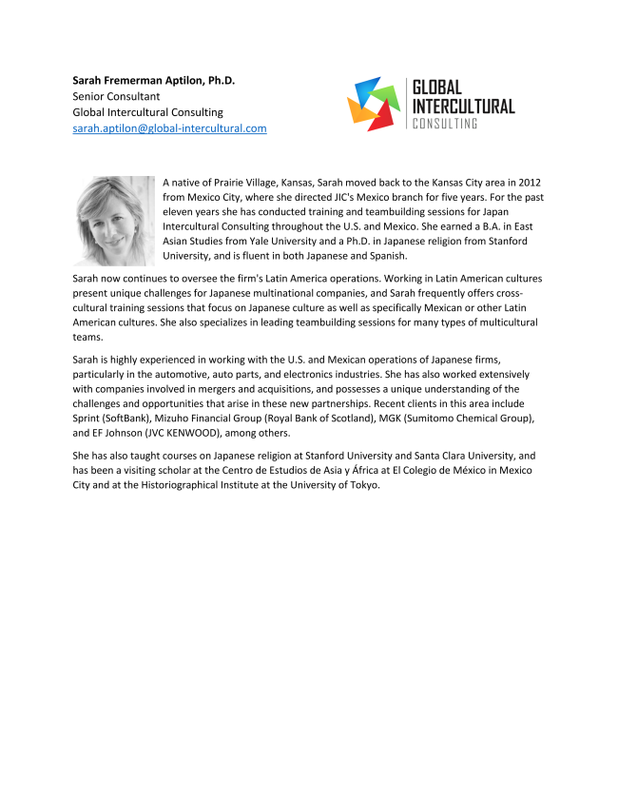 Sarah has conducted cross-cultural training and team building sessions throughout the United States and Mexico in Japanese, Spanish and English since 2006. She has worked extensively with companies involved in mergers and acquisitions, and possesses a unique understanding of the challenges and opportunities that arise in the new partnerships.